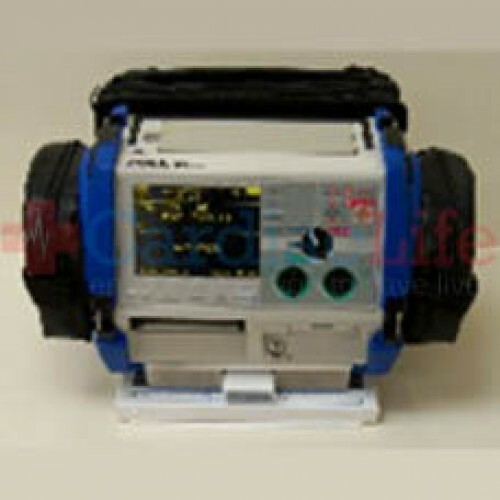 This Defibrillator Mount for the ZOLL® M Series w/Extreme Pack 2 (set of blue bumpers which surround the sides of the unit) and NIBP provides the maximum protection for your defibrillator. It works to minimize the risk of costly repairs due to device impacts or falls during transport. More importantly, these mounts will protect your staff and patients from flying defibrillators in the event of a sudden stop, accident or rollover. ZOLL M-Series Shelf Mount with Swivel may be used on an ambulance or crash cart. When installed onto an ambulance, it will secure your M-Series in the event of an accident or sudden stop. 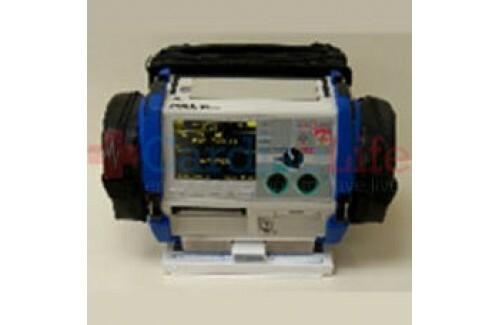 The defibrillator may be secured by placing the defibrillator on the mount and sliding back. It may be removed by pressing the button, sliding the unit forward and lifting. The mount may be swiveled to the right or to the left. When you purchase the Defibrillator Mount for ZOLL® M Series w/Extreme Pack 2 & NIBP from Cardiac Life you'll receive Free Shipping and the tools needed to begin creating a successful Public Access Defibrillation (PAD) program. To be indemnified under the Good Samaritan Law, follow manufacturers guidelines. Use AEDSafetrack Program Management to document that your AED is compliment with local and state laws.